Darkness, loud noise, chaos. These are the factors that often define horror movies. They're primal things with the fundamental ability to scare us. A Quiet Place is remarkable in that it utilizes elements of the exact opposite. This is a film in which silence and calm are integral to the tension, and large sections take place during the daytime. Somehow, calling it “special” doesn't seem sufficient, considering that it's one of the most accomplished and effective chillers I've ever seen. That's not hyperbole. The concept involves hideous alien creatures who cannot see and therefore hunt by sound. Where they came from is not explained, nor does it need to be. We follow the Abbotts – father Lee (John Krasinski), mom Evelyn (Emily Blunt), son Marcus (Noah Jupe), and hearing-impaired daughter Regan (Millicent Simmonds) – who live on a large sprawl of land and carry on their day-to-day routine in near-total silence. They place trails of sand along their property so they can walk around silently, and paint rectangles on the non-squeaky parts of the floorboards in their home. A Quiet Place does a superb job of setting up the “rules” of its premise. The first forty minutes are spent showing the safety precautions the Abbotts take to avoid being discovered, as well as the way they communicate without speaking. The attention to detail is as impressive as it is crucial. We see glimpses of how average, ordinary things are modified so as to avoid making noise. When the kids play Monopoly, for instance, they use cotton balls and pieces of fabric as markers. The approach makes us consider how we would have to customize our own lives in this situation, thereby laying a foundation of tension. You don't realize how much sound you generate on a daily basis until you think about cutting it out completely. Needless to say, the silence is eventually shattered, putting the family in great peril. 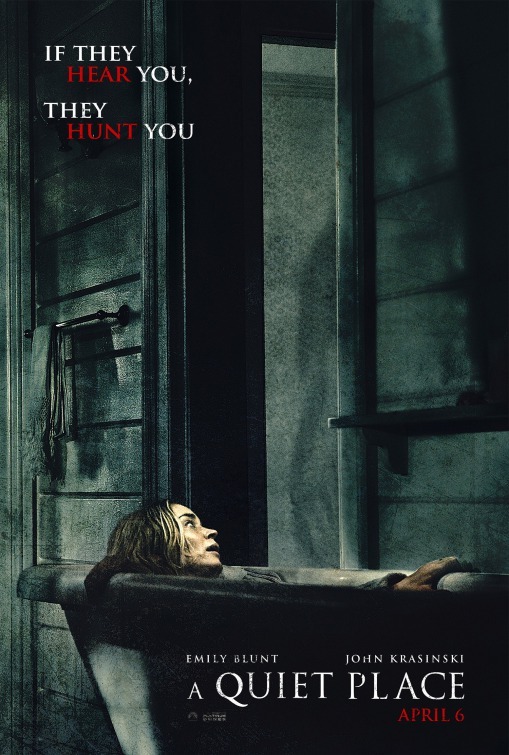 One of the most compelling things about A Quiet Place is that it transcends being a standard monsters-stalking-people chiller. Even when their cover is blown, the Abbotts have to preserve the serenity of their setting to avoid drawing even more creatures. Better still, the screenplay throws in a bunch of “grenades” – predicaments that make silence borderline impossible. Instead of abandoning the concept when the aliens fully arrive, the movie clings to it even harder. Do you remember being in school and getting the giggles in the library, then trying really hard not to laugh so you wouldn't get in trouble? And the more you tried, the harder it was not to crack up? Now imagine that feeling as a horror movie and you've got A Quiet Place. Every scene amps up the tension from the scene before. It is masterfully constructed to continually tighten the screws until you can't take it anymore, then keep right on tightening them. There's genius in the way the script – by Bryan Woods, Scott Beck, and Krasinski (who also directed) – layers one thing on top of another. As scary as it is, and it is indeed very scary, the thing that gives A Quiet Place its greatest impact is that we truly care about the characters' safety. Although it works as a grade-A monster movie, this is, at heart, a family story. These people have already been through a lot by the time we meet them. Their ordeal has created fear in Marcus, worry in Evelyn, and an unspoken tension between Lee and Regan. Every single moment is focused on how the predicament with the aliens affects them, solving old problems and creating new ones. All the actors do excellent work, but the standout is Millicent Simmonds (Wonderstruck), whose eyes register emotional pain that is absolutely searing. She's the heart of the story. A Quiet Place runs a tight 84 minutes, excluding end credits. Not a single second is wasted. While efficiently paced, the movie has a wealth of suspense and a powerful human component. Those things combine to create horror that feels consequential. It shakes to the core, and you love it. A Quiet Place is rated PG-13 for terror and some bloody images. The running time is 1 hour and 30 minutes.